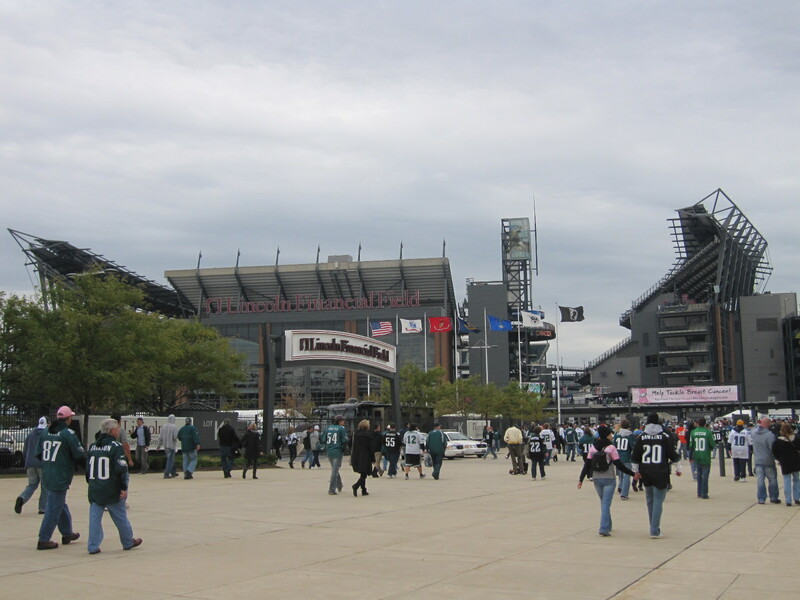 On Sunday, I went and checked off another stadium in my quest to hit them all. 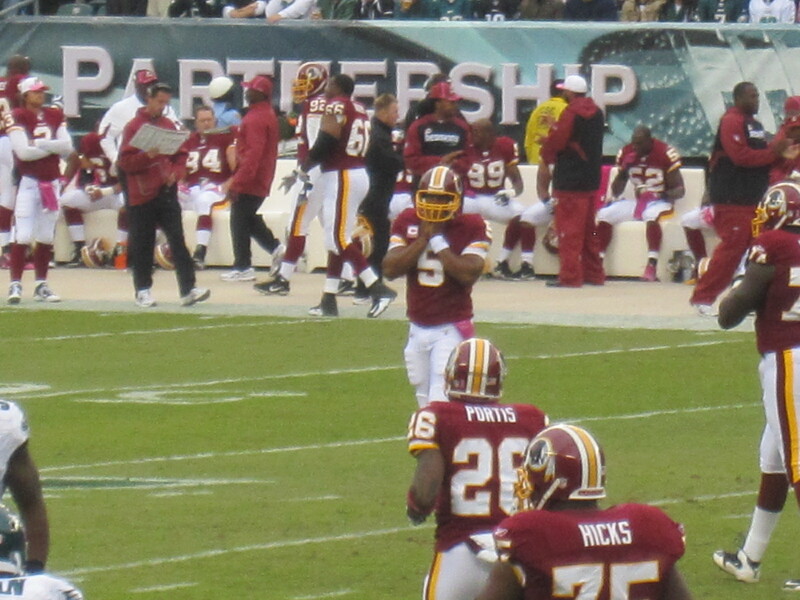 I finally decided to hit Lincoln Financial Field to watch the homecoming of Donovan McNabb. The Washington Redskins were in Philly to take on the Philadelphia Eagles and I wanted to also check out Michael Vick. It hit me that it was homecoming weekend when I was at dinner with my friend Erika on Saturday night. She'd missed my birthday and wanted to make it up to me, and I was craving Mongolian beef so off to P.F. Changs we went. At the restaurant we were surrounded by kids that were dressed up to the nines and it hit me, that it must be "Homecoming" season. Well, how appropriate that I'd chosen to go to Philly to see the Redskins v Eagles match-up! I hauled my lifeless body out of bed and drove to Philly. It's an easy drive (i.e. about 2 hours) and by about 3PM (i.e. 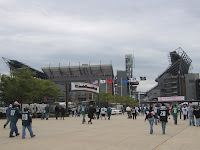 after paying $25) I was parked in a lot staring at Citizens Bank Park. Immediately I was reminded that I needed to check and see what the National League Division Series match-up would be when I got home. I've been hoping for a Cincinnati Reds v Philadelphia Phillies match-up so I can see the Reds easily. Although, schedule permitting I do intend to go to Cincinnati and see the Reds at home... Fingers crossed. 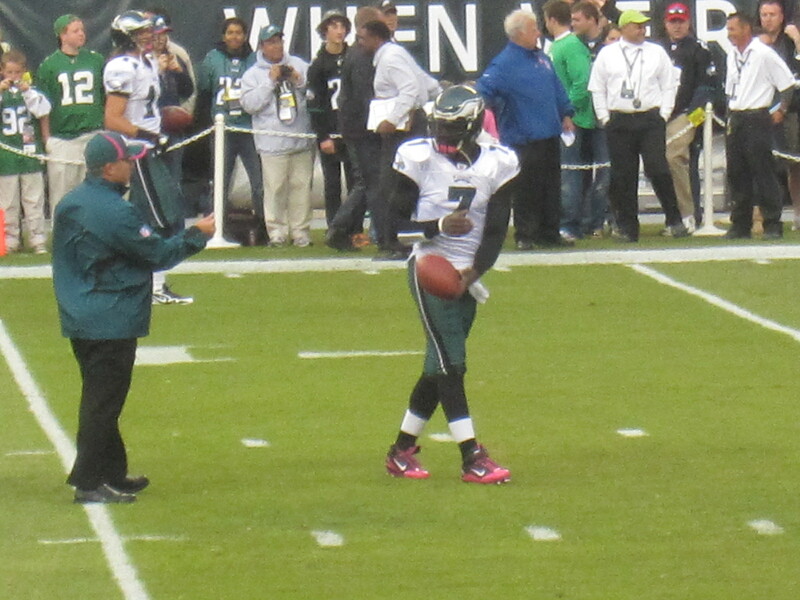 Before the game started, I was curious (i.e. along with everyone else in the free world) as to how Eagles fans would react to McNabb's return. 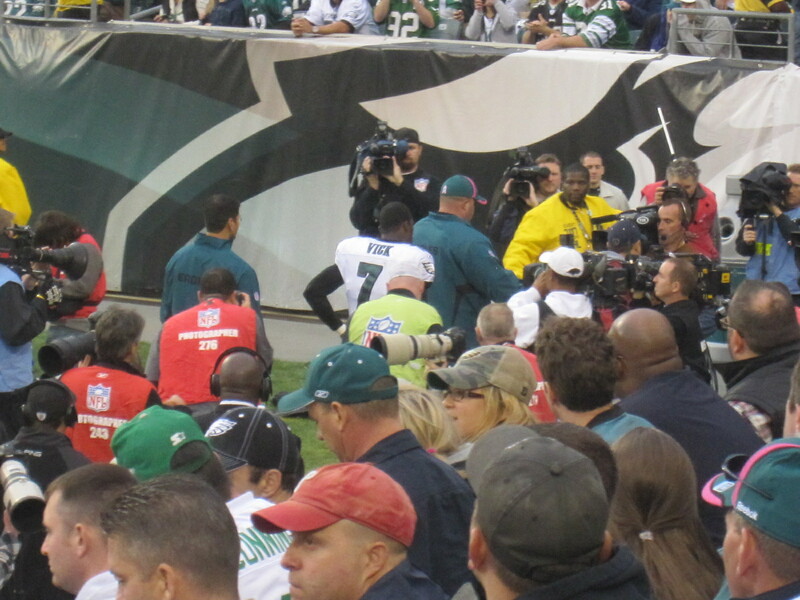 As he was introduced and ran onto the field, people stood, cheered, and clapped for McNabb. There were some boos, but the cheers were louder. 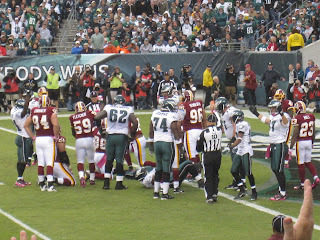 Eagles fans were respectful towards him, and I was inpressed by their class. 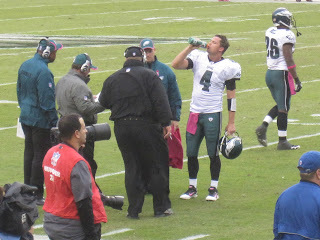 Kevin Kolb... Yeah, I really didn't care. 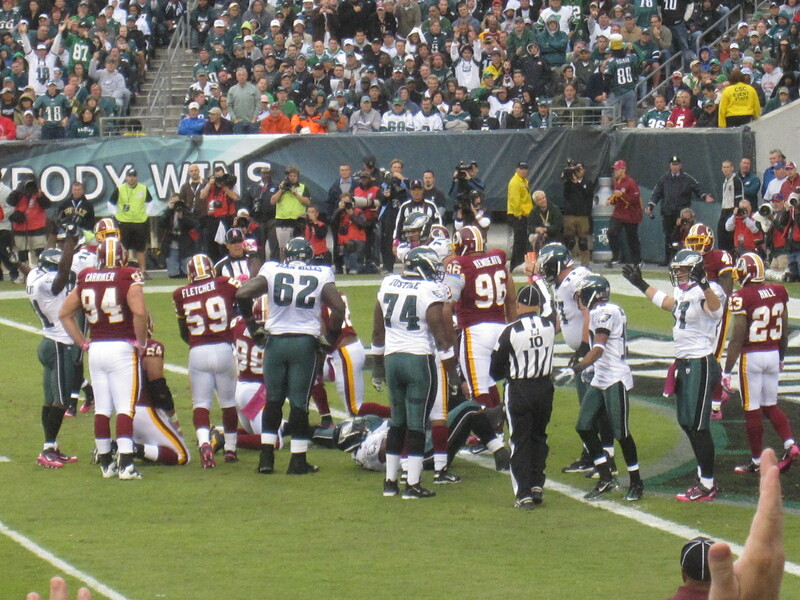 As the game went on, it seems like penalty after penalty was being called against the Eagles. 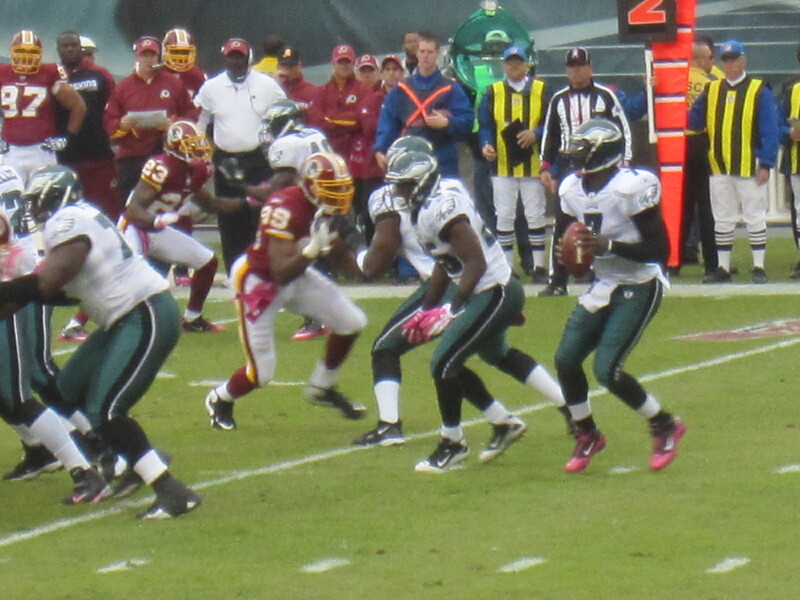 Needless to say the Eagles' fans around me were getting progressively annoyed. With every false start, holding, and even horse collar call, the man behind me would yell towards the field, "Your mom holds/false starts/horse collars." Ahh yes. That's more of what I expected. Here's one for you, as McCoy got up and walked off the field, the loud mouth behind me said, "Hey, McCoy. 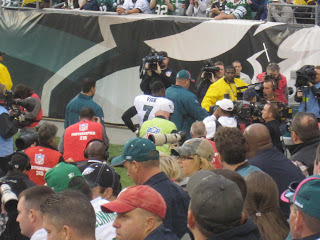 Did Andy Reid promise you 2 vicodin if you got up?!?!" WOW. I have to admit. That was funny! 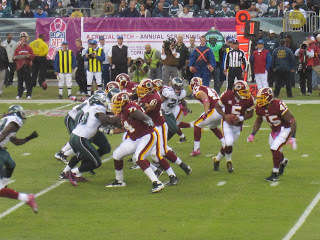 There were some older ladies around me also and they were hostile when it came to rooting on the Eagles defense (i.e. or lack there of), but this is football so I wasn't too surprised. Aside from that douche behind me, the majority of fans were just fine. Then agan, I did see at least 4 other occasions where someone was about to get punched. Security seemed to be everywhere to handle and attempt to diffuse the situations "quickly". 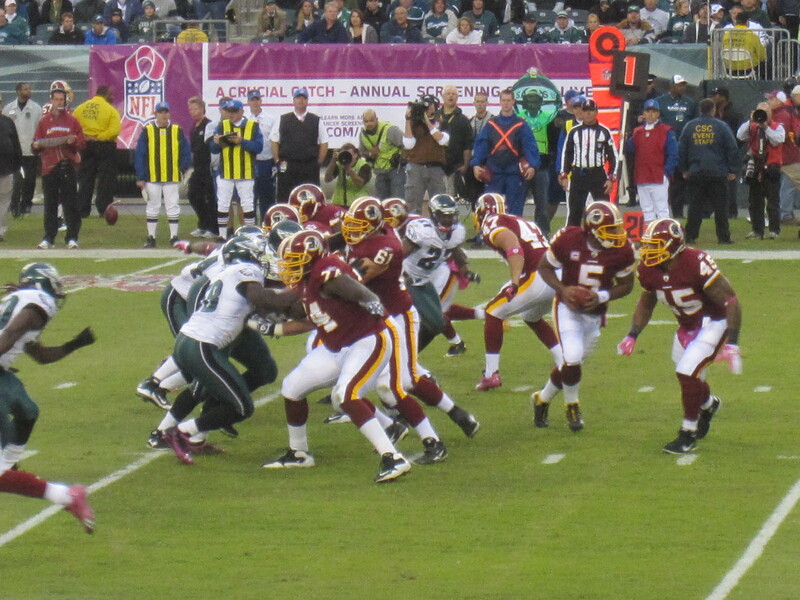 It was drizzling during the game, and I was wearing my mini-skirt and Uggs. Not the best choice, I've ever made, but I survived. 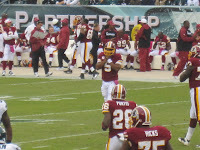 With about 5 minutes left in the 4th quarter I knew the Washington Redskins were going to win and I wanted to beat traffic so I bee-lined for the parking lot. I'll admit, I also wanted to check out Harrah's in Chester on the way home. I just need to see the Sixers (i.e. 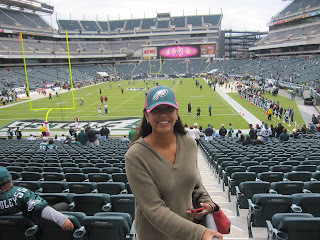 Philadelphia 76ers) play at home, and I can cross the city off of my list! Time to check the schedule. If you are an Eagles fan, and you want to help raise awareness for breast cancer here's a shirt for you. It's a great cause. I'm glad you enjoyed your day among the Eagles faithful on a day everyone was watching for something embarrassingly controversial. 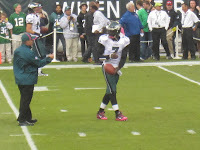 It is disappointing, though, that Vick got crunched and denied his fans and detractors a chance to see that he is well worth the hype for his on-field work. 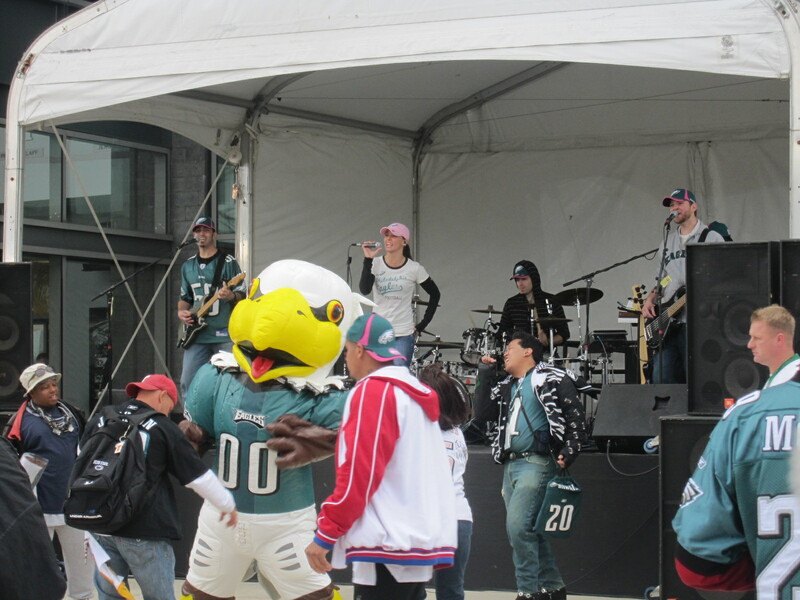 Kristen puts on a great show but the pre-game crowd prefers the tailgate off the corporate premises. 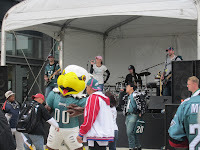 On the other hand... Mr. Greengenes energetically working the Phillies parking lot during the playoffs is very very different. Besides being treated to great baseball by the Reds and Phils, you'll get to see the astroturf living rooms, the constumed cult groupies...and phist phights. i believe in having a great ticket to any events i attend... it makes the experience so much better! 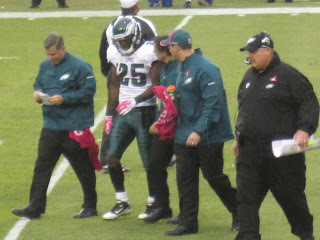 i was disappointed to see vick go out injured, but it was refreshing to see mcnabb get the respect and cheers from the eagles fans! thanks for your comment about the blog. hope i can entertain. there are some great stops coming up and the schedule should be fun so stay tuned!